Keloid scars can occur anywhere on the body, but they are more common on the upper chest, shoulders, abdomen, upper back, and ears. Although anyone can get them, people with darker skin tones develop keloid scars more frequently than those with lighter skin. Even though keloid scarring can be frustrating, viable keloid scar treatment options exist and can help to manage this issue. Since there is a risk of recurrence, non-surgical methods for keloid treatment are recommended. Keloid formation can occur due to any type of skin injury. Unlike typical scars, keloids can grow beyond the original wound, creating a larger issue than the injury itself. These scars don’t pose any kind of health issue, but given that they can be a significant cosmetic issue, there are options to have them removed. Instead of forming a neat scar that is level with the surface of your skin, keloid scar tissue is “raised, rubbery, and usually a firm growth that overtakes the wound and continues to develop,” says Lee. It is important to note that hypertrophic and keloid scars can look similar in some cases, but they are not identical. Keloid scars can occur anywhere on the body but they are more common on the upper chest, shoulders, abdomen, upper back, and ears. They can appear directly after an injury or procedure or in some cases can develop months later. Keloids have a tendency to enlarge progressively over time. If an individual is susceptible, they can also have multiple keloids. Keloid formation can occur from trauma, surgical excision, burns, body piercing, acne scars, or any other skin injuries. Infections and hormonal dysfunctions have also been proposed as triggers in some people. Though not as common, chickenpox scars can lead to keloid scarring as well. Though anyone can get them, keloids typically occur between the ages of ten and 30 years. People with darker skin tones form keloids more frequently than those with lighter skin. Santa Monica dermatologist and professor of dermatology Dr. Tanya Kormeili suggests that women are more at risk from C-sections, piercings — particularly ear piercings — and following certain types of surgery. Those of Asian and sub-Saharan African descent are at a greatest risk for developing keloid scars on their ears. The treatment of keloids will take a series of treatments over several months, which will depend on how aggressively the keloid is growing. Your dermatologist or surgeon will advise on the best treatment plan to suit your individual skin condition and situation. Using topical silicone gel is one of the main non-surgical methods for keloid scarring treatment. Clinical studies have shown that silicone products reduce the inflammation associated with scar formation. Radiation therapy has proven beneficial in decreasing the activity of the cells that form scar tissue. For those with recurrent or particularly dramatic keloid scarring, a low dose radiation therapy in conjunction with scar revision may prevent keloid recurrence. This treatment for keloid scarring works by applying constant pressure to surface blood vessels, and eventually causes the scar to flatten and become softer. “A compression bandage prevents overstretching of the area of the wound as a result of frequent movement, which can promote the development of excessive scar tissue,” says Lee. Corticosteroid injections such as Kenalog, which contains triamcinolone, are administered via local injection directly into the scar formation to help soften tissue, reduce inflammation, and minimize the chance of scarring. Only small amounts are injected at a time as they can be quite painful. Repeated treatments are usually necessary. Steroid injections have been shown to flatten keloid scars from 50 to 100%. This is reserved for scars that have failed to improve with nonsurgical treatments. Surgical removal of the scar remains one of the most effective and immediate treatments for scarring. Kormeili suggests laser treatments can also be an effective tool for scar minimization. “Laser treatment uses light to reduce the inflammation and kill off the extra blood vessels that feed the keloid,” says Kormeili. When pulsed dye laser (PDL) and long-pulsed Nd:YAG laser were split-scar tested (half of a scar undergoing PDL and the other half Nd:YAG laser) on twenty patients, both treatments were shown to be equally effective. The patients had six treatments at one month intervals. Liquid nitrogen, known as cryotherapy, has been studied as a keloid scarring treatment. The procedure works by freezing the scar tissue over a freeze and thaw cycle through several treatments. Cryotherapy is sometimes combined with steroid injections. Though there has been some success in the flattening of keloid scars with cryotherapy, it’s still not a commonly used treatment option. Verapamil, used as a topical cream applied to keloid scars after steroid injections, has been shown to prevent rebound scarring. However, there is mixed evidence when it comes to its effectiveness. Some studies show that the use of Verapamil had no impact on the outcome of keloid recurrence. “Keloids can be very difficult to treat, and they have a tendency to reappear even after scar removal,” says Lee. This is why it’s important to see a trained professional who understands how to treat keloids effectively. Lee says that where scar revision surgery is used, it is usually combined with steroid injections or radiation therapy to minimize the chance of the keloids recurring. Radiation therapy has been shown to be the most effective treatment in reducing recurrence rates. In many ways keloids are a type of skin tumor, as they have a tendency to continue to grow and become tumorous in nature. In the majority of cases they are benign — meaning, that they are not skin cancer. There have been some cases of secondary tumors developing on top of keloid scars, though this is extremely rare. The images below present one such case, a keloid scar on the ear from first appointment through treatment. Using injections and a pressure earring, which at first made the keloid worse, the treatment made the keloid scarring recede for some months before returning with extremely rapid growth. On examination, basal cell carcinoma (skin cancer cells) was identified growing from within the keloid. If you notice strange moles and freckles, keloid scarring, or any kind of skin abnormality that looks suspicious and is growing or changing rapidly, always seek professional medical advice. If necessary, have a skin biopsy. Scars are formed as part of the healing process when wounded tissue expresses collagen through a process called collagen synthesis. This eventually results in the formation of an inelastic mass with a different texture and quality than the unwounded tissue that surrounds it. In the case of a keloid scar, this process can take on a life of its own and last for years. As a result, keloid scars are more pronounced than most other scars. According to the American Society of Plastic Surgeons (ASPS), keloid scars are most likely to form in areas where there is not much underlying fatty tissue — such as the face, ears, neck, chest, and shoulders. Hypertrophic scars look similar but do not grow beyond the borders of the injured area. Keloids, on the other hand, spread beyond the boundaries of the initial skin injury, and often continue to grow over time. Keloids are also usually very thick — thicker than hypertrophic scars. There is strong evidence to suggest that family history and genetics influence the formation of keloid scars. If other family members have them, you may also inherit them. People with darker skin tones develop keloid scars more frequently than those with lighter skin. 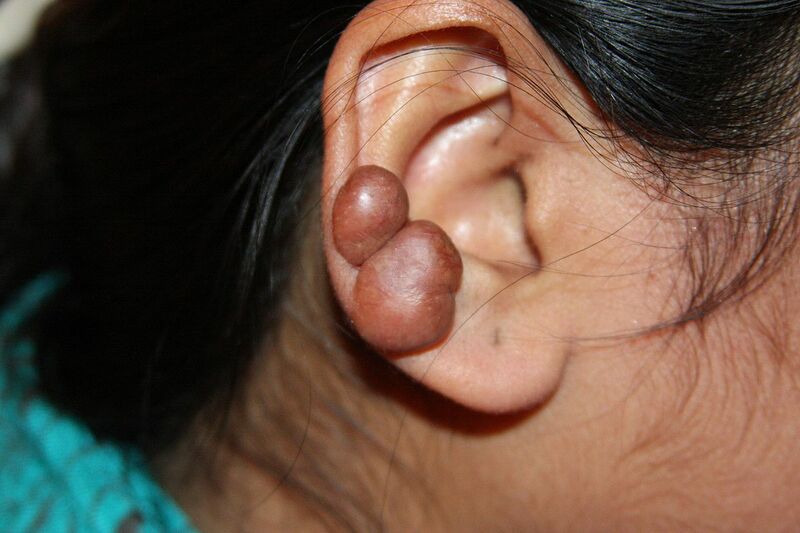 People of Asian and sub-Saharan African descent are at the greatest risk for developing keloid scars on their ears. In the future, Botox injections, ultraviolet light treatments, topical creams, and other treatments may expand patients’ options. Speak to a board-certified dermatologist or plastic surgeon to learn more about keloid scar treatment.